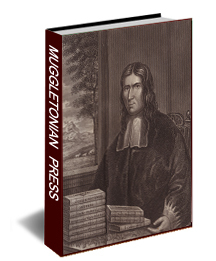 Following the death of John Reeve in 1658 Lodowick Muggleton faced a revolt against his leadership of the Muggletonian church while at the same time desiring to consolidate the theological developments he sought to make to his predecessors legacy. Lodowick Muggleton's first solely self attributed work concerned the Book of Revelation, however the majority of his subsequent works consisted of spirited assaults on various Quakers (including such luminaries as George Fox, Isaac Pennington and William Penn), a distaste that was actively reciprocated. Muggleton also wrote a prescient tirade against the prevalent belief in witchcraft and a posthumously published autobiography, "The Acts of the Witnesses of the Spirit". This volume contains the full texts of the following works, newly typeset and presented in one volume. 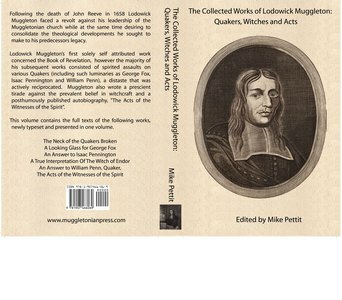 "The Neck of the Quakers Broken", "A Looking Glass for George Fox", "An Answer to Isaac Pennington", "A True Interpretation Of The Witch of Endor", "An Answer to William Penn, Quaker," and "The Acts of the Witnesses of the Spirit".